Crossing Drinnon Pass, towards the Devil’s Range. 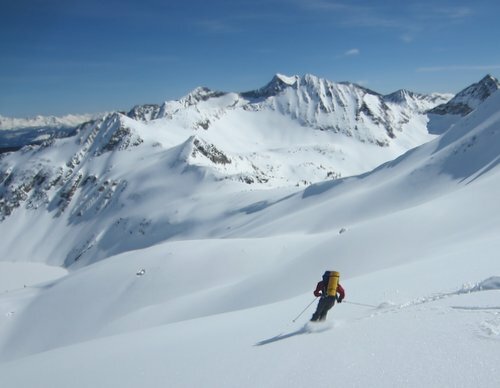 Setting fixed dates for a ski traverse hasn’t been a successful strategy these past few snowy Spring seasons, so this year Cam and I left ourselves as big a window of opportunity as possible to attempt the Valhalla mountains. 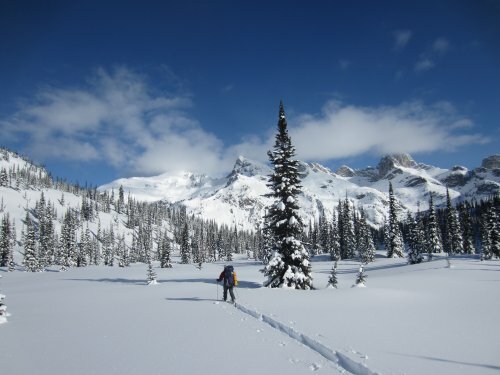 Conditions came together perfectly this past week, and we took advantage of bluebird windless weather and a stable snow-pack to ski from Hoder Creek (slogged in from the end of the plowing), out via Shannon Creek (with minor variations to the standard route), in four big days. 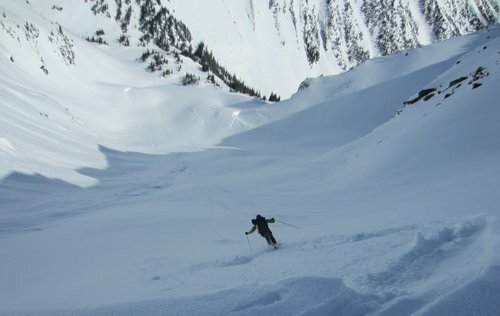 It stayed cool enough that the South facing climbs (love the ski crampons) held together through the day, and the multiple North facing descents were uniformly perfect, light, boot-deep powder. Lows down to minus 15 degrees made for cold camping (don’t love the leaking Therma-rest), though the group at Ice Creek lodge did welcome us in for a night of luxury. The Valhalla’s are a steep and spectacular range, and I feel privileged to have been able to enjoy them as we did. Valhalla Mountainscape (Click for full-size image). 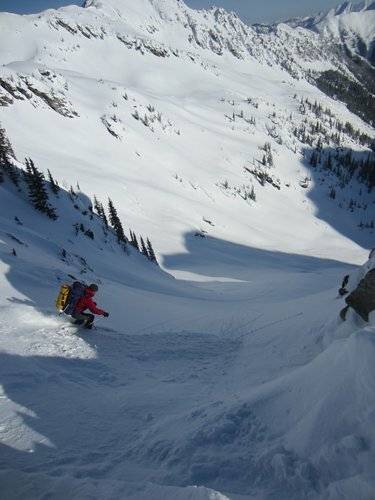 Cam skiing from the summit of Mt Meers 2724m (8937 feet). 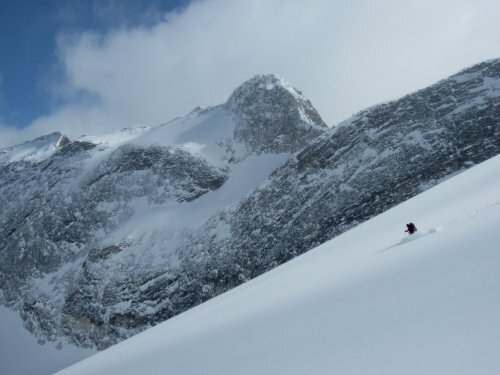 Skiing the North Face of Mt Meers. 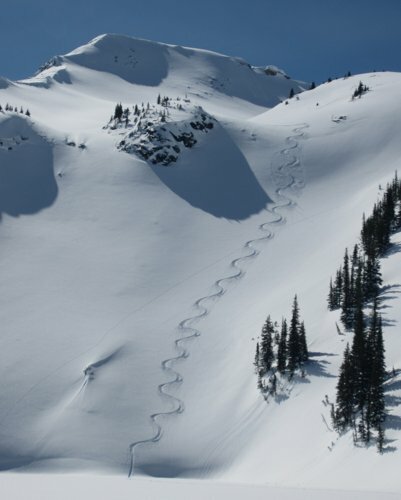 Another perfect line off another unnamed peak. 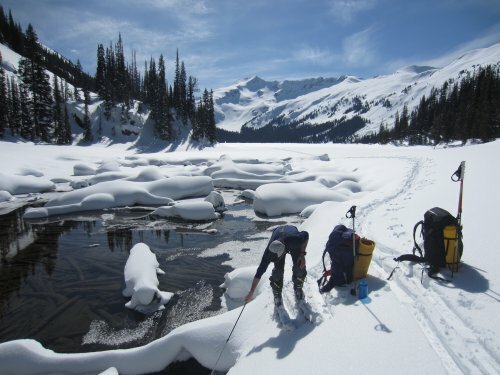 enjoyed both photos and narrative of your tour, but it would be interesting to put your accomplishment in perspective by knowing what gear you selected for the tour, especially what boot/binding/ski combination you used as well as the total weight of your packs at the start of the trip. Fast and light, with no compromise on the descents. 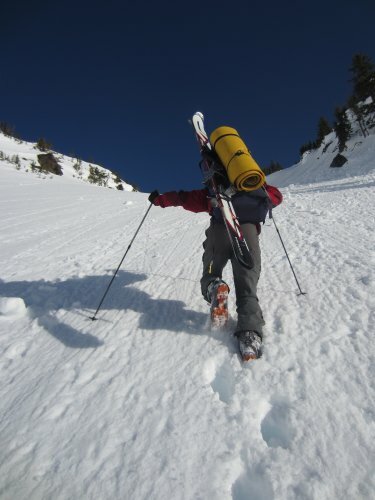 Dynafit Titan UL boots, Dynafit Speed Radical Bindings, DPS Wailer 112RP Pure (190cm) skis. Didn’t actually weigh our packs, but I use the highest-end lightweight gear and packed as minimally as possible – no spare clothes or extra days food. I’ve been waiting for these! Sensational photos (& vid), as usual. What a life!